It was a chance encounter in May last year at the 2015 Balmoral Show at the Maze when I passed the DUP stand. I came across the then party leader and First Minister, Peter Robinson MLA and then Minister for Finance and Personnel Arlene Foster MLA, who had taken over the portfolio a few days earlier at the start of that week. I had not seen either for a while and both readily agreed to have their photograph taken, which I used in an article I wrote for the Northern Standard. The way Peter put his arm around Arlene’s shoulder was perhaps an indication that later in the year she would become his preference for a successor when he announced he was standing down. Both were in very good mood at the time and I was fortunate to get a picture of them in an informal setting, rather than an office or the Assembly chamber. Arlene Foster then turned the tables and very kindly offered to take a photo of myself with the then First Minister, proving her media skills! During our brief encounter, I did not ask Mr Robinson whether he was thinking about Arlene as a successor at that stage. But ten days later he was admitted to hospital with a suspected heart attack and was fitted with a heart stent. I assure you the timing was coincidental! Arlene Foster grew up in Roslea, County Fermanagh, just across the border from Scotstown in County Monaghan. Her father, a small farmer, was a full-time RUC member and was injured in an IRA gun attack at their home in 1979. As a teenager in 1988, she survived an IRA bomb in Lisnaskea, which exploded under her school bus while it was being driven by a part-time UDR soldier. A qualified solicitor and former member of the Ulster Unionist Party, Arlene Foster has always been very courteous in dealing with media requests for interviews. I wish her well in her new post, in which she will share responsibilty for government in Northern Ireland with Sinn Féin’s Martin McGuinness. She has written an article for today’s Belfast Telegraph in which she outlines some of her priorities. She says she wants to lead the North in the right direction and ensure that children grow up in a better Northern Ireland than she did. 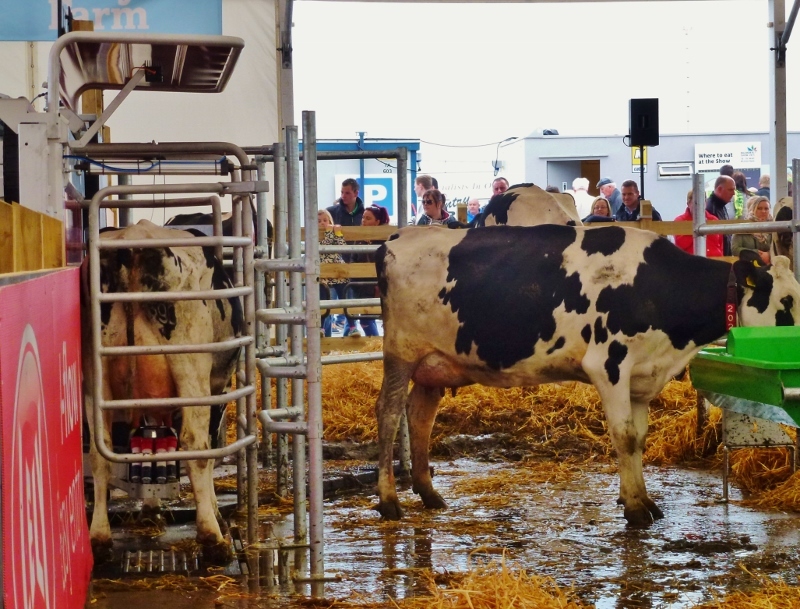 The robotic milking parlour by Lely was a big draw for the crowds this week at the Balmoral Show. Plenty of interest too in the judging of various categories including dairy cattle. Traffic problems did not seem to be as bad as two years ago but it still took half an hour to get out of the main car park yesterday afternoon (Friday). Even in a crowd of thousands the chances are you will always meet someone with a Monaghan connection. 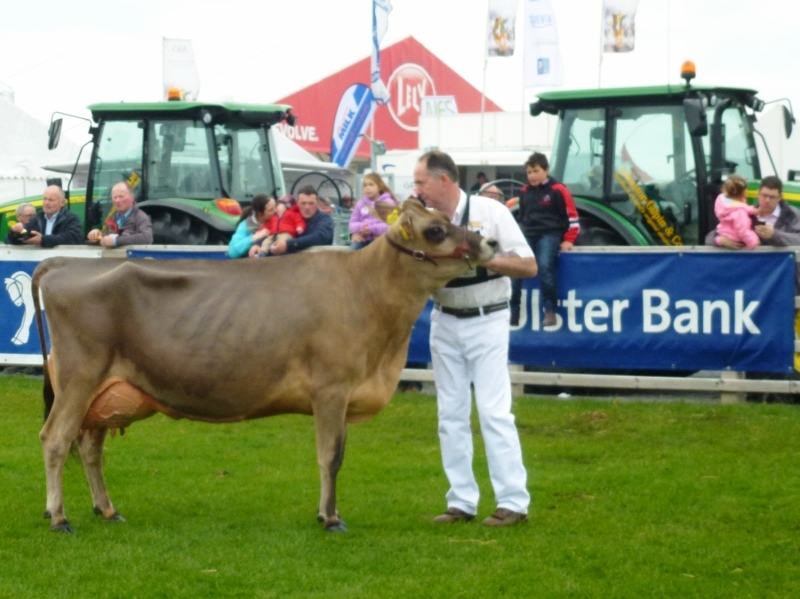 So it was at the new-look Balmoral Show, transferred by the Royal Ulster Agricultural Society from its usual venue at the King’s Hall in Belfast to the Maze/Long Kesh development site near Lisburn. Amidst the rubble of the H-Blocks and with some of the watchtowers and remainder of the security wall from the former high security prison in the background I came across Charlie Barker from Derryvalley in Ballybay. The former nurse at St Davnet’s hospital is a volunteer with the Riding for the Disabled Association Ireland, based at Geraldine Bellew’s Cloncaw Equestrian Centre in Glaslough. 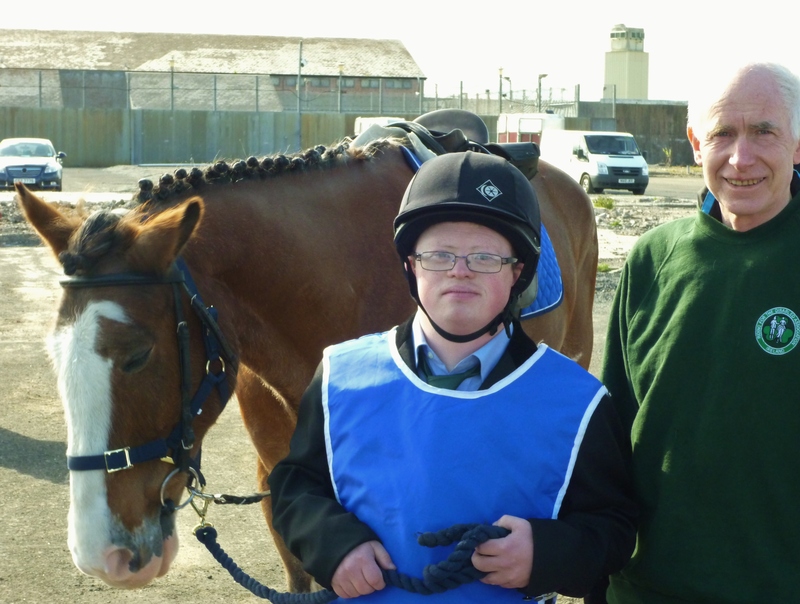 He was helping Tom Cloonan from Castleshane to take part in a riding display involving games in one of the outdoor arenas. It was organised by RDA groups from the North.The Monaghan group meets every Tuesday morning and helps a dozen or so people with learning difficulties to enjoy riding a pony, in this case “Major”, which Geraldine had transported to the show. Keeping them company was Mary Foley from Lemaculla, Ballinode. 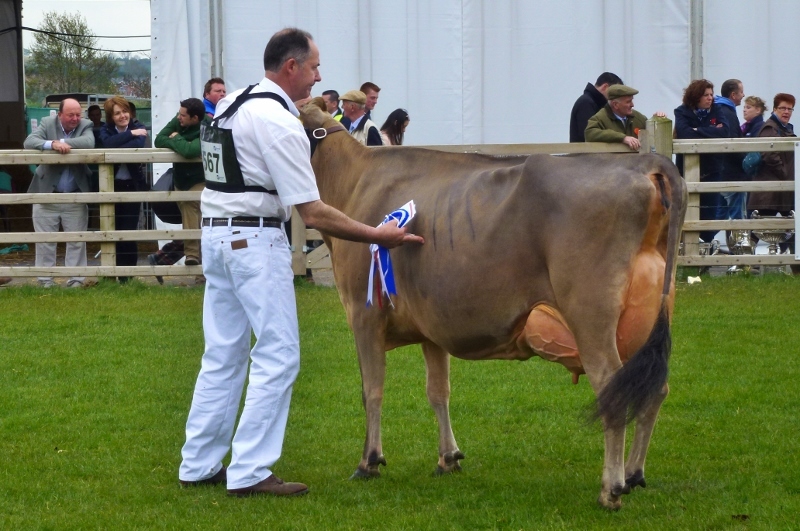 Another Glaslough connection encountered at the new Balmoral Park was David Boyd from Mullaghduff, a Holstein cattle breeder and dairy farmer, who had a number of them entered in the show. He has been on the Irish judges’ panel for the past twenty years and has judged at shows throughout Ireland, England, Portugal and Italy. 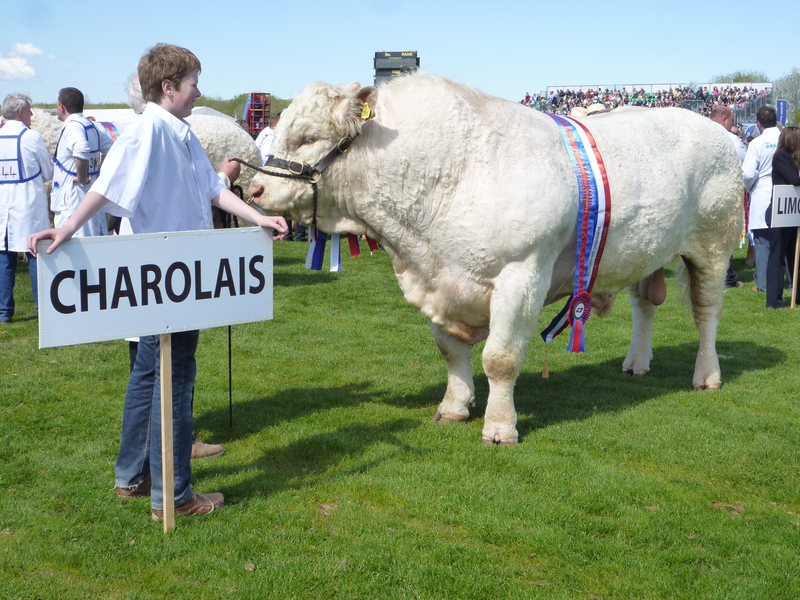 In March he was a judge at the European Holstein Championships in Switzerland. It was Holsteins that took the two top spots for the dairy interbreed section at Balmoral. David was among the visitors at the Town of Monaghan Co-op stand, where chairman Hugo Maguire from Clones was on hand to greet suppliers, their families and friends and provide them with a welcome cup of tea and delicious scones with cream and jam. The visitors included another Glaslough man, Trevor Keith, along with two brothers, Paddy Rafferty from Monaghan and Eddie from Sheetrim, Tydavnet. They were accompanied by Brendan Greenan from Ardaghy. 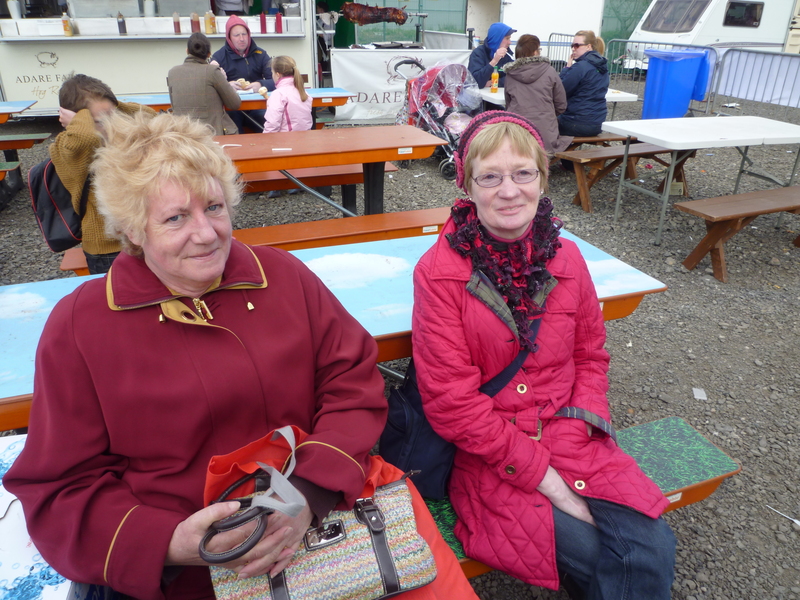 In another part of the 65 acre complex beside the main arena I met Ann Connolly from Tydavnet, who was with Joyce Blackburn from Monaghan, enjoying a break after a long day at the show. 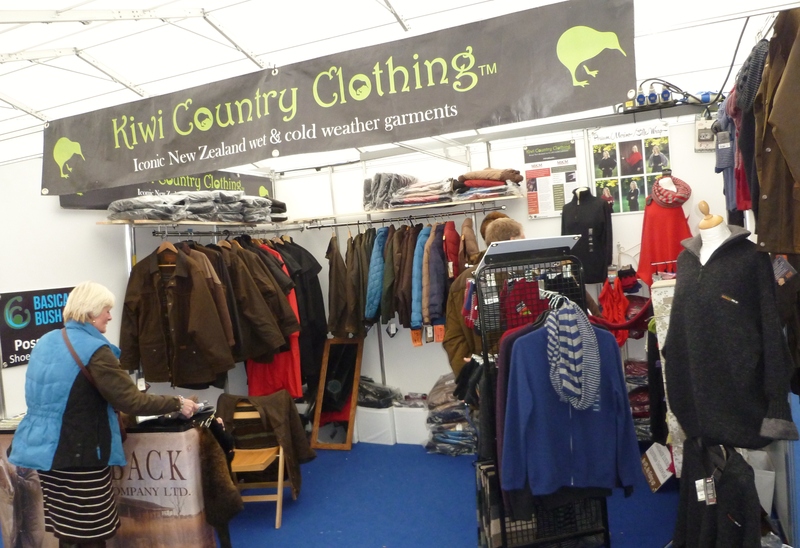 Their excursion might have brought them into contact with Liz McGuinness from Tydavnet, who brought her range of Kiwi Country Clothing to the shopping village. She told me that after one year in business she was now exporting her goods to a number of countries. In another part of the complex, Castle Leslie in Glaslough was promoting its leisure breaks. 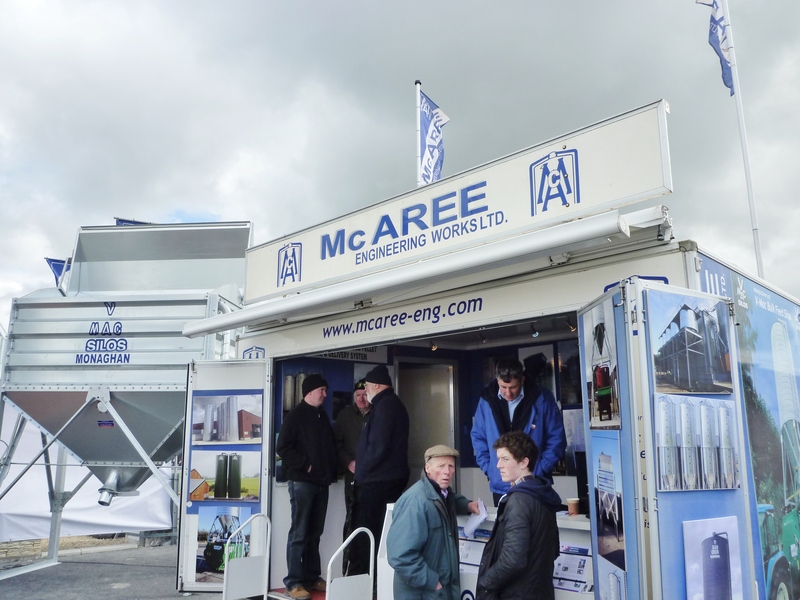 But one of the most impressive displays from Monaghan was from McAree engineering of Ballinode, regular exhibitors at the trade stands. 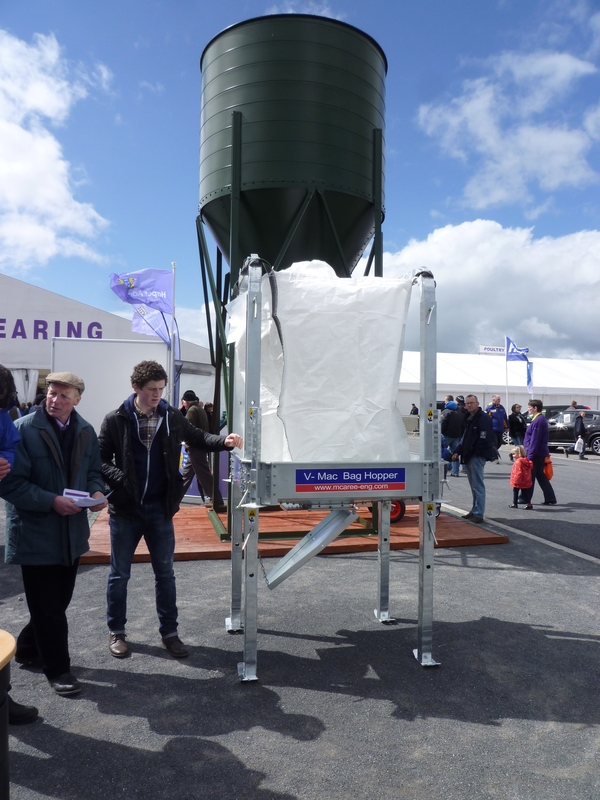 Eamonn McMeel and Noel Kiely were busy showing their range of V-Mac silos, hoppers and tote bins to prospective clients. The company used the show to test the water for its latest product, which immediately caught my attention when I visited the stand. The V-Mac bag hopper with adjustable “legs” can be transported on a tractor with a buck rake or grab to collect a one ton bag of meal from the merchant and then bring it back to the farm and store it. The hopper has a chute at the bottom to dispense whatever amount of feed is required. Hopefully this design will prove to be another success for the company and we can expect to see more of them in use around the county. 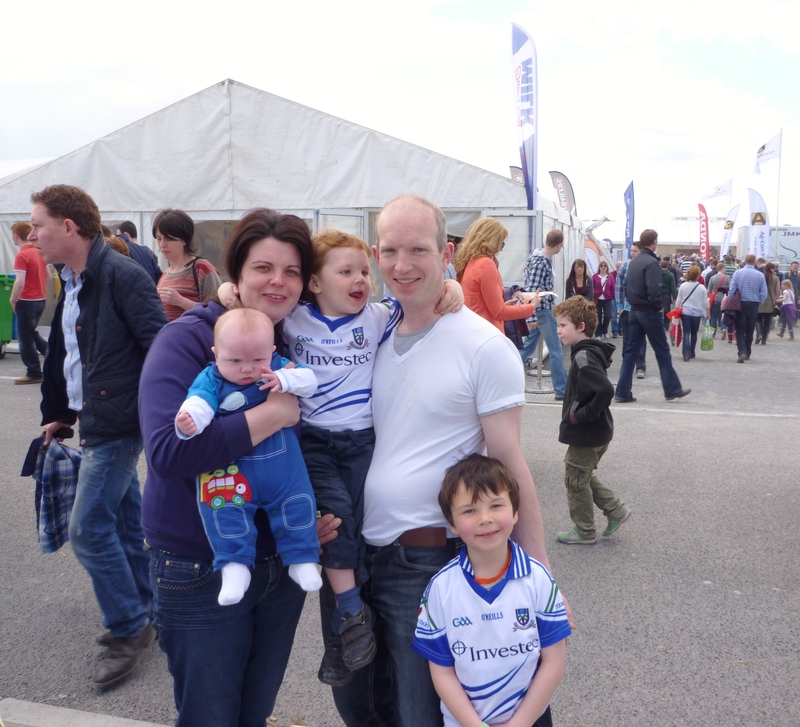 The Balmoral show had something to attract all ages and when I saw a young lad in a Monaghan GAA top I immediately went over to his parents to discover it was Joe McCarey from Dundian, Carrickroe, enjoying a day out with his wife Pauline and three sons, one of them a baby, Páidí, named after the great Kerry footballer who died last year. Cathal (standing in the front of the picture) is becoming a media personality, having appeared in the Irish News and also on the RTÉ Sport coverage of the Monaghan v Meath division III final when the camera zoomed in for a close-up of him, apparently! 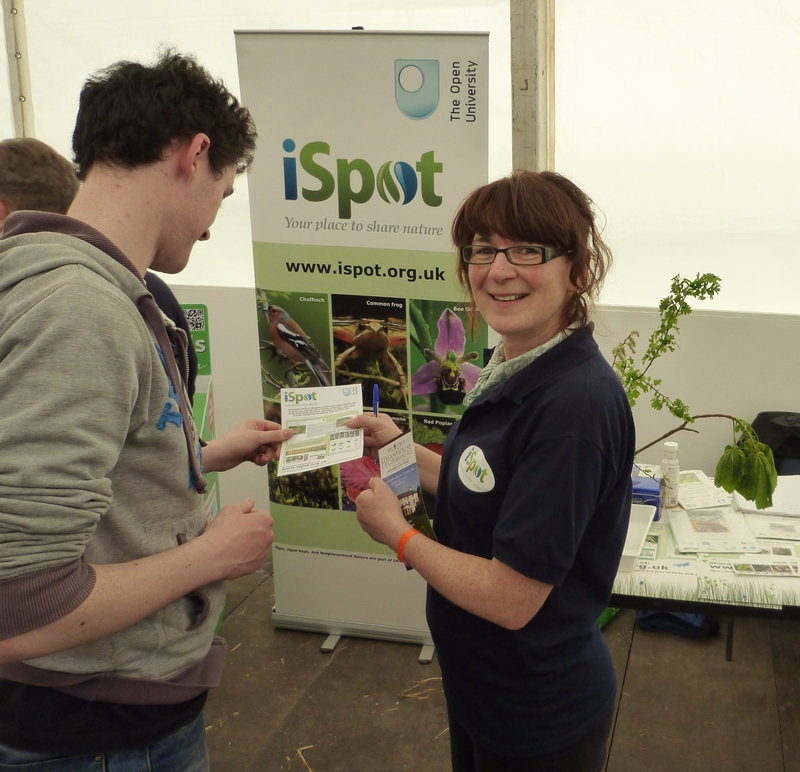 Over at the childrens’ farm, earth science expert Gretta McCarron from Monaghan had set up a stand for the Open University iSpot programme, encouraging people to identify and record wildlife and plants. 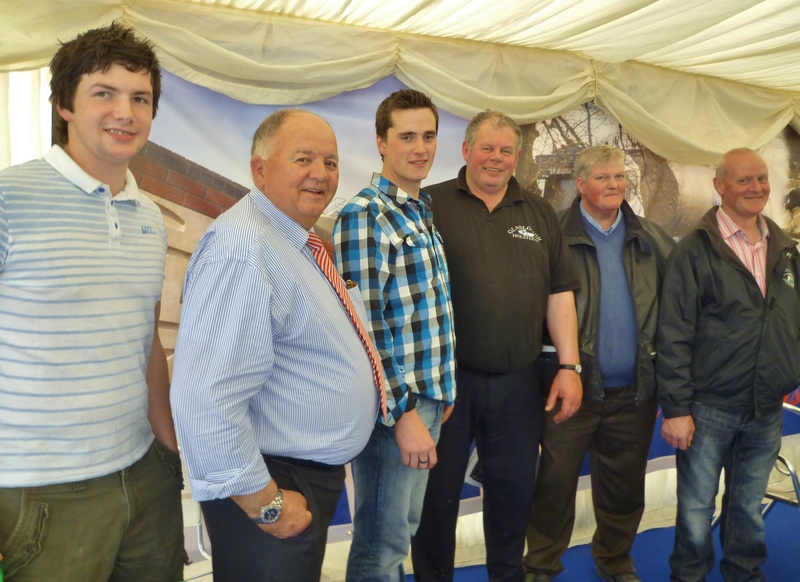 All in all it was a very successful show at the new Balmoral Park, with a strong Monaghan presence. 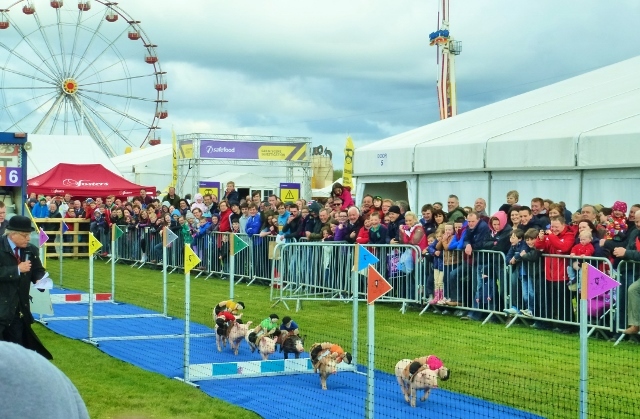 Thousands have again poured through the gates on the third and final day of the Balmoral Show at its new location on the site of what was once the high-security Maze prison near Lisburn. It used to house prisoners from republican and loyalist paramilitary groups, many of them serving life sentences for murder. Following a provision in the Good Friday agreement in 1998, the prisoners were released and the jail was closed in 2000 when the last four prisoners were freed. Demolition of the H-Blocks began on 30th October 2006 but after some controversy, part of the prison including the hospital block and one H-block were kept. Unionists are now protesting against any plans to preserve these structures, which republicans feel are important because of their role during the 1981 hunger strike, in which ten inmates died. By chance, I am writing this while watching an RTÉ News report about the force-feeding by US authorities of prisoners at Guantanamo Bay detention camp at an American naval base in Cuba. The farming community voted with their feet and gave their backing to the decision made last year by the Royal Ulster Agricultural Society to move from their long-standing home at the King’s Hall, Balmoral, in South Belfast and to settle down instead at a 65 acre site at the Maze. Several huge marquees helped to make the complex into a tented village. One of them housed all the cattle. 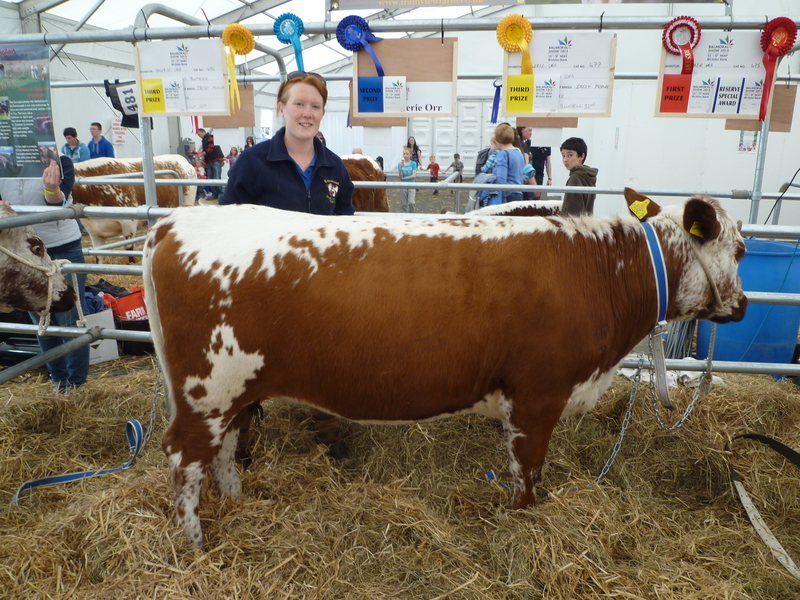 Among the prizewinners in the Irish Moiled category which made a return to the show this year after a gap of 70 years was Valerie Orr from Trainview Farm in Ballygowan. Valerie featured at the launch of the show in March. The grand parade in the main arena this afternoon with representatives of all the classes (except dairy cattle, which had to be milked!) was very impressive, with all the prize winners showing off their rosettes and cups. There had been many problems with traffic arriving at the show on Wednesday. Although things had improved considerably by the final day, some motorists still reported difficulties on the approach roads, caused in one case by a filter traffic light for a right hand lane allowing only six cars through at a time. Although the police were nearby, they remained in a car apparently and did not attempt to override the lights in order to improve the traffic flow. My experience was that on the second day, I found no problem arriving by car in the late afternoon, but it took over twenty minutes to get out of the car park at 7pm. A slip road to the M1 motorway which runs alongside the perimeter of the site is urgently needed. So for the other two days I let the train (and bus) take the strain. I travelled by train from Adelaide station past Balmoral and the King’s Hall to Lisburn where there was a shuttle bus to the Maze. Translink staff told me between 40 and 48 single and double-deck buses were used for the service. Leaving the show site at 5:10pm at peak time, I was back at Balmoral (station) in one hour, with hardly any delay at Lisburn station, although a signalling failure had caused delays on the line. So take a bow, Translink staff, for providing excellent public service and showing good co-operation between bus and train divisions. Perhaps next time something can be done to designate a route for buses only and to give them their own entry/exit point, in order to improve journey times. Roll up, Roll up for the Racing Pigs! 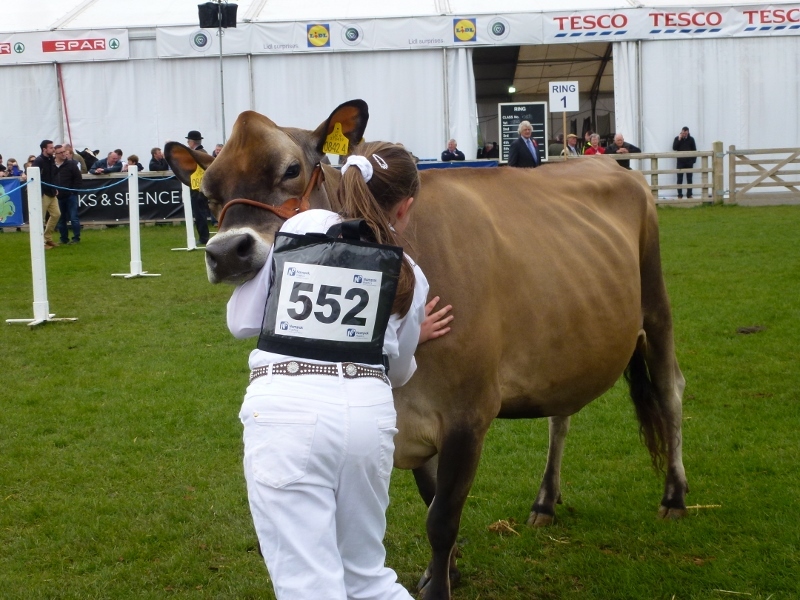 It was an a-mazing second day at the Balmoral Show. Standing in the shadow of two watchtowers, a security wall and other reminders of the former high-security jail, I met a group from the Riding for the Disabled Association (whose President is the Princess Royal, sister of Prince Edward, who opened the show yesterday). They came from clubs in Newtownards, Banbridge and included some members of the RDA Ireland from Monaghan. I was at the Maze only once during its previous existence as a high-security prison. Making a radio programme for BBC Radio Birmingham in the mid-1970s, I spent a night with a British Army regiment known as the Birmingham Gunners (39 Medium Regiment Royal Artillery) in the military base on one part of the site. I remember it was around the time of St Patrick’s Day and I eventually found a suitable spot to drown the shamrock. Next day I was taken in a Land Rover on one of their perimeter security patrols and was also shown into one of the watchtowers. From there I could see a group of prisoners exercising in one of the H-blocks. One of them was running around the large cage and when he spotted a face in the observation post, he made a two-fingered gesture and shouted towards his “audience”. The Gunners did four “emergency” tours of duty in the North in the 1970s, the first to Fort George in Derry in 1973, which, like the Maze, is now earmarked for a regeneration project. At the time of their deployment at the Maze, the squaddies were also in Craigavon and some were stationed at the border checkpoint at Aughnacloy. Some years previously in 1969 while on exercise in Libya, the Regiment found itself caught up in the military coup of the then Captain Muammar Gadaffi against the government of King Idris. Now after some 37 years I was back at the Maze, but in a very different context. 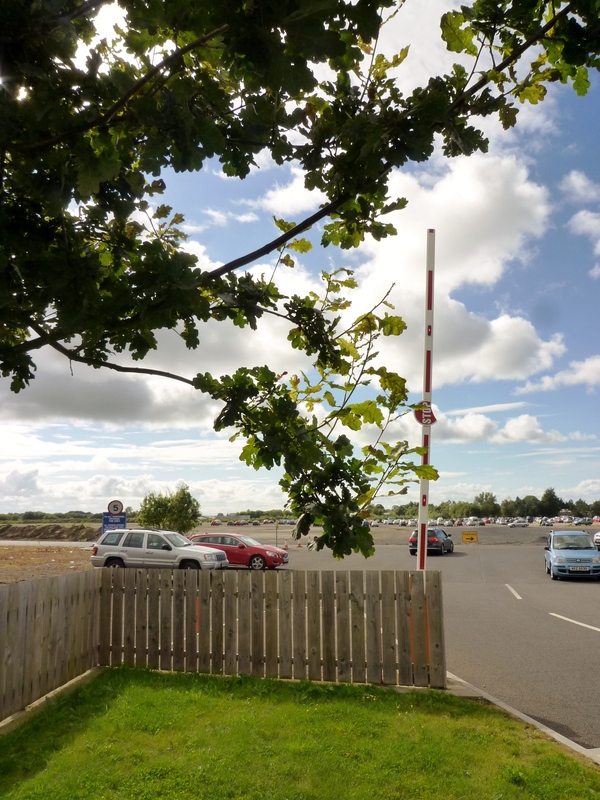 With thousands of cars parked on hard standing all paths from the car park led to the main entrance of the 145th annual Royal Ulster Agricultural Society show. This event transferred from the King’s Hall complex at Balmoral in Belfast is helping to bring a promising future to the site of the former jail. The transformation is being carried out by the Maze Long Kesh Development Corporation. Programme Director Kyle Alexander confirmed to reporters this evening that funding for the development of a Peace-building and Conflict Resolution Centre is expected to be in place by the end of this year. 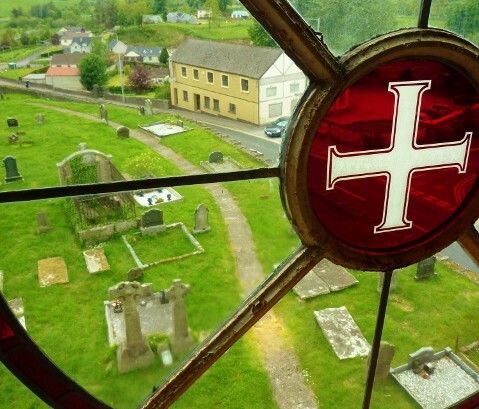 Although the Corporation wants to emphasise that the 347 acres should be a shared site, some unionist politicians and loyalists have protested that the preserved hospital and one H-block from the prison should not be allowed to become a “shrine” for the republican hunger strikers who died there. 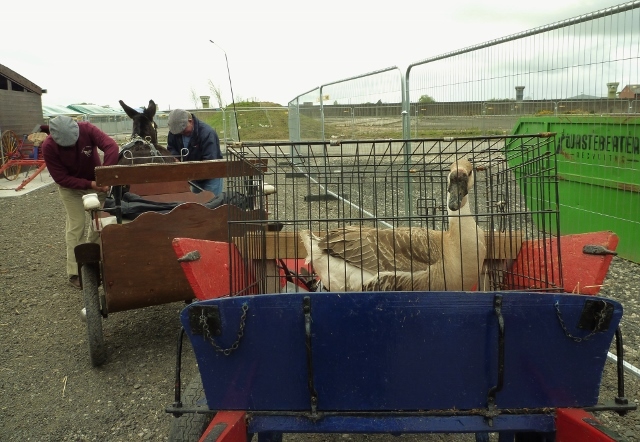 Meanwhile the show will continue for a third day, with initial traffic problems apparently sorted, although the delays in arriving now seem to have been transferred to departure from the site. There are plans to build a slip road to the nearby M1 motorway in 2015, which would ease congestion along the narrow access roads around the complex. 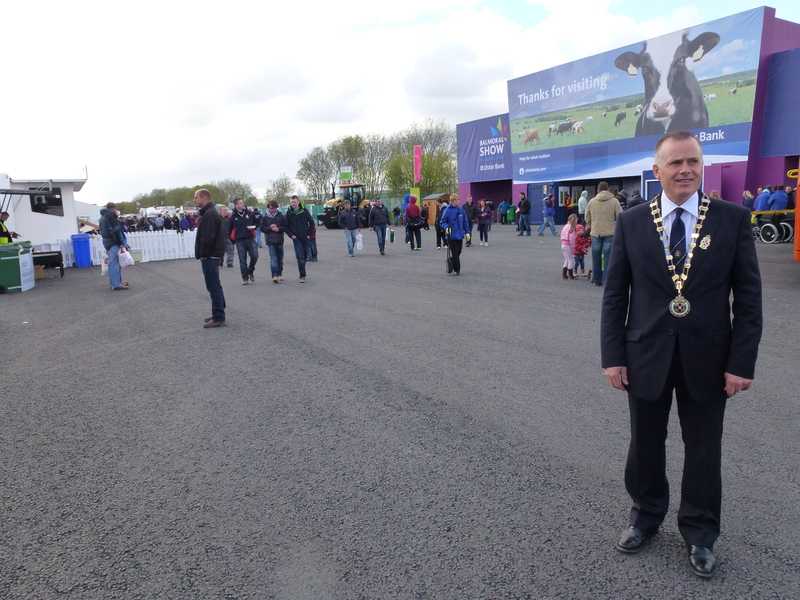 RUAS President John Bamber was pleased with the opening day of the show and said he hoped the traffic management plan put into place with the PSNI and Roads Service would help to ease congestion, especially for those travelling from West of the Bann. The Maze was once the site of Northern Ireland’s high security jail, spread out over 360 acres. 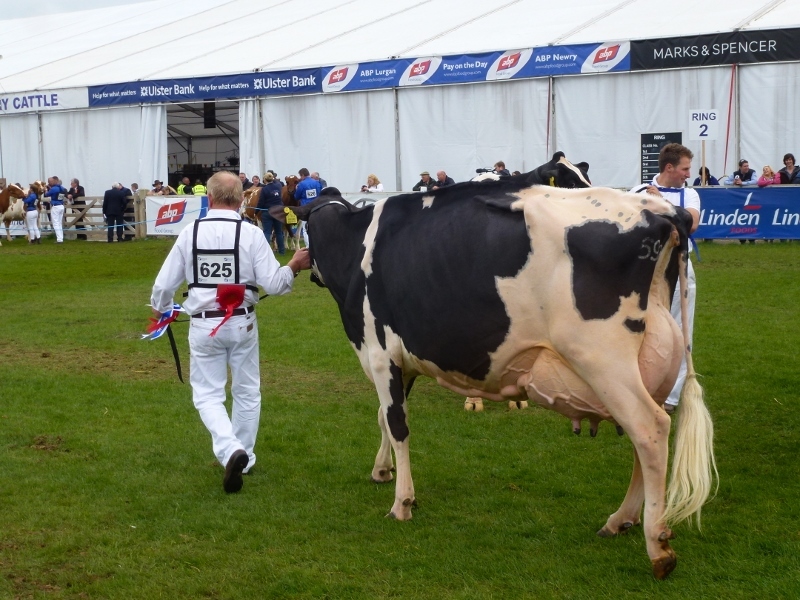 Today saw a new chapter in its history as thousands made their way to Balmoral Park, the new venue for the annual Royal Ulster Agricultural Society show. 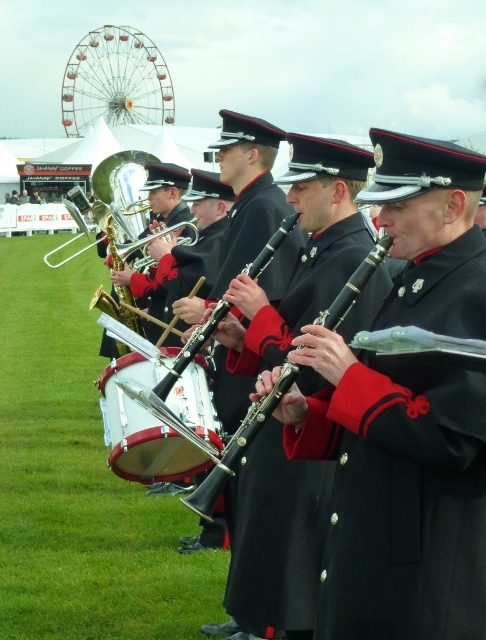 Helping to entertain the crowds in the main arena was the Army No.1 Band from Cathal Brugha Barracks in Dublin, under the direction on this occasion of Captain Fergal Carroll. Who would have thought that 13 years after the closure of the prison in 2000 and the release under the Good Friday agreement of the remaining loyalist and republican paramilitaries who had served sentences, that an Irish Army presence would be welcomed there. In addition, I noticed the tricolour flying alongside the Union flag and the flag of Canada in the same arena, where the showjumping was held. As the band was performing for the second time, the riders were coming out to inspect the course for their competition. 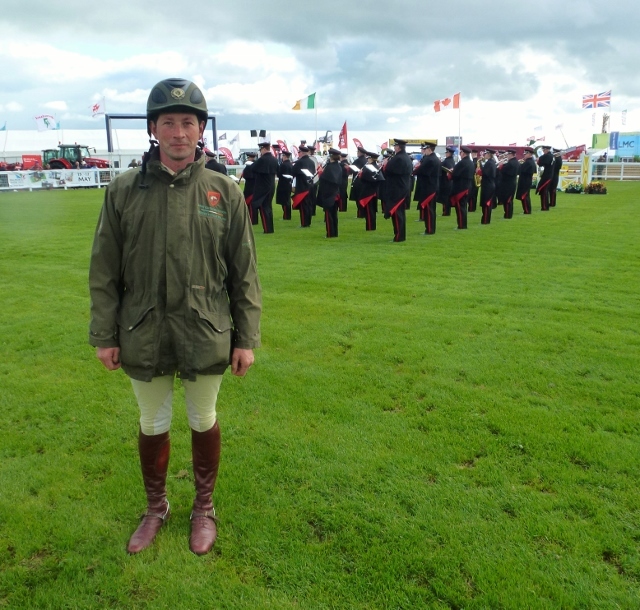 Among them was Captain Geoff Curran from the Army Equitation School at McKee Barracks in Dublin, who met Queen Elizabeth during her visit to the National Stud in County Kildare in May 2011. In the past, the cages on this site were the H-blocks, housing prisoners. Now the only cages and huts are those holding animals and livestock. There is just the hospital wing and part of the H-blocks remaining. 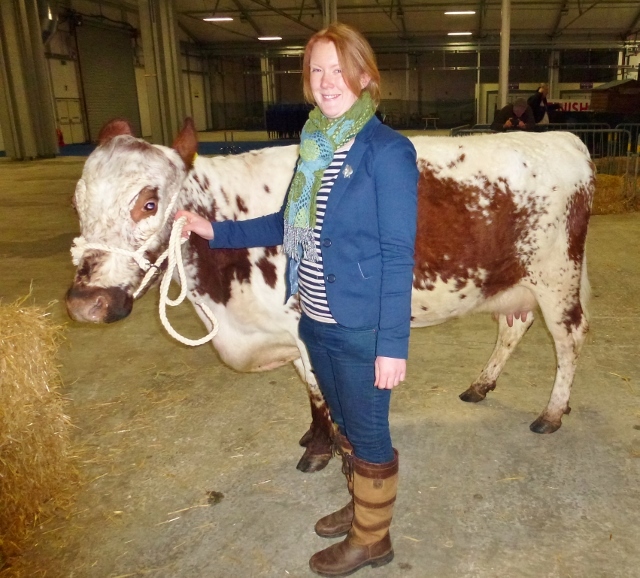 It has taken many months of planning to get the Balmoral Show to its new site at The Maze. I passed by recently on the M1 motorway and saw in the near distance the extensive tented village and the hard standing for the car park area. Today I was able to enjoy a visit to the complex. 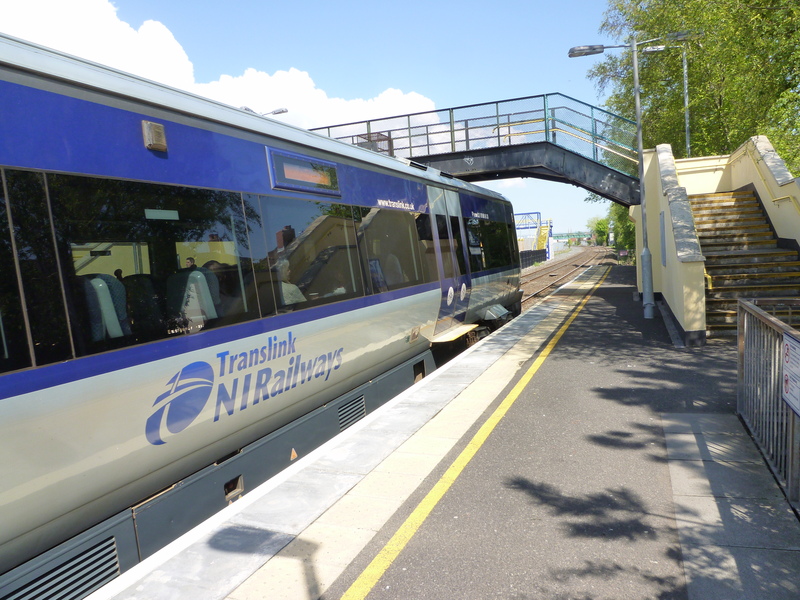 Translink had put on special transport arrangements for public transport, including a shuttle bus to and from Balmoral Park from Lisburn station. The journey to the show via Hillsborough and Culcavy took half an hour but the return at 6:30pm took half the time. My sister-in-law travelling from Monaghan and others heading from West of the Bann trying to reach the show from the M1 motorway ran into great difficulty. She took four hours, having left at 9am. The former Ulster Unionist leader Tom Ellliott MLA had a similar story. He left Fermanagh at 8:30am along with two children in the car and did not reach the showgrounds until 1:30pm! 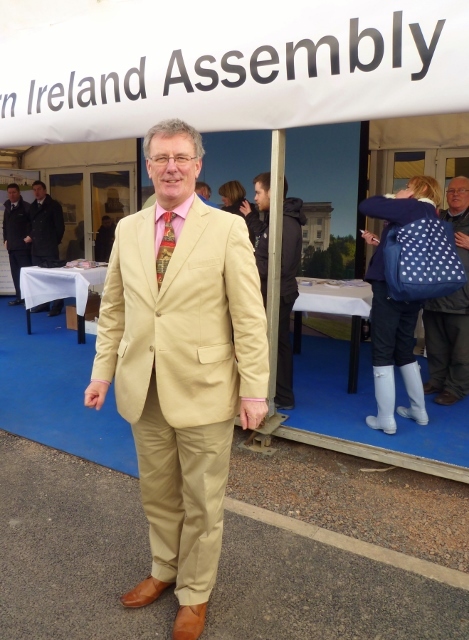 His successor Mike Nesbitt though had no such problems and told me he had taken less than half an hour to reach Balmoral Park. For more background on the move to the Maze site and the programme of events see my post in March. Getting ready for Balmoral Show 2013. The launch was at the King’s Hall complex, where it has been held since 1896. 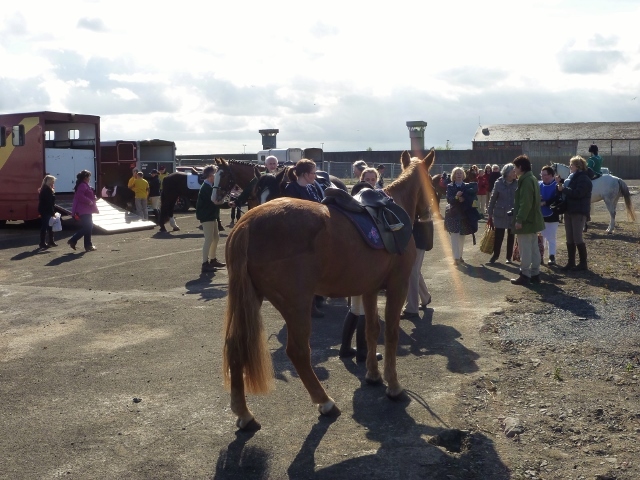 But this year the Royal Ulster Agricultural Society’s premier event is moving to a new 65 acre complex at the former high security Maze prison site near Lisburn. The space is more than double the size of the Balmoral showgrounds in South Belfast. The move which Society members approved last June is quite historic and it’s going to be a phenomenal success, according to the RUAS President, John Bamber. It’s Ireland’s largest agri-food show and attracts exhibitors and visitors from throughout the island. The organisers are hoping to surpass the 70,000 crowd they had last year. 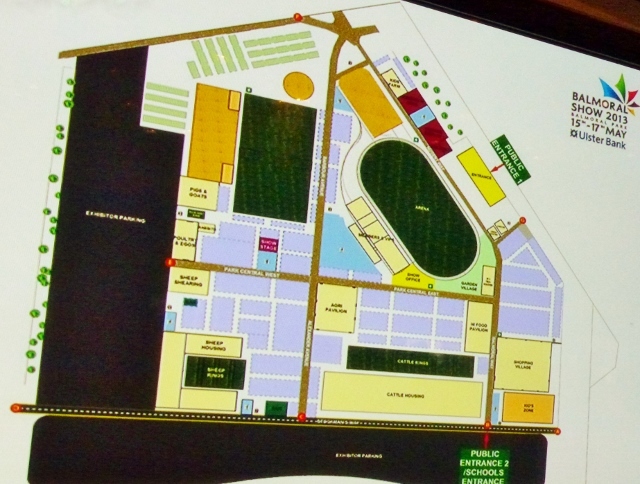 The new showgrounds is called Balmoral Park and will have most of the usual attractions as well as a funfair for the first time. They say it will be bigger and better than previous shows. Balmoral Park, designed by the London architects Studio Egret West, with its well laid out walkways and paths (many bearing street names with a respectful nod to the past), green spaces and landscaped areas, allows a greater space for trade exhibitors, larger facilities and warm up/practice areas for competitors. The arena increases in size by 25%. 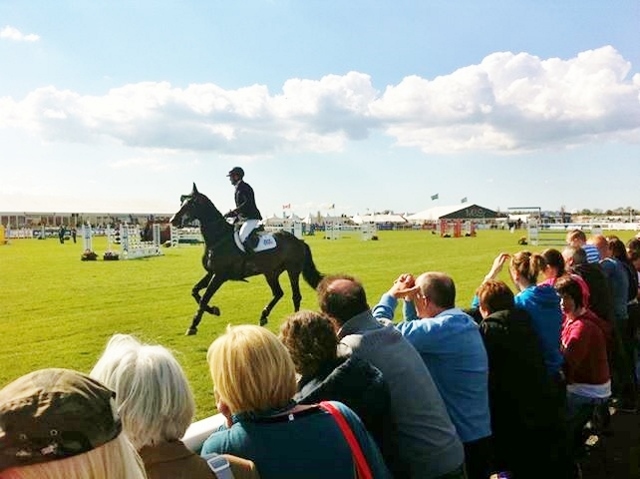 Adjacent to this is an area of tiered seating and landscaped banks allowing spectators to view show jumping, pony club games, the inter hunt chase as well as the headline attraction – The Kangaroo Kid. 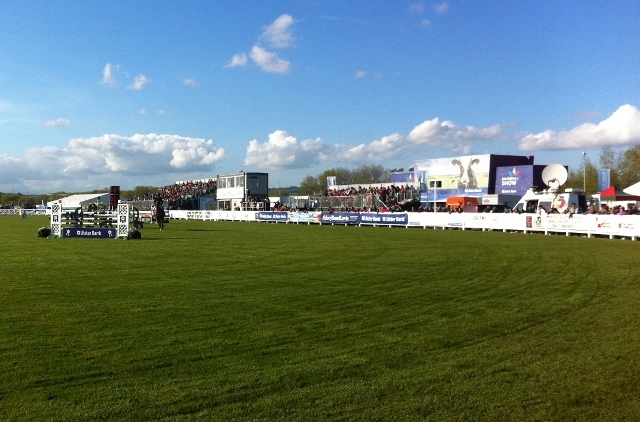 The cattle lawn, sheep, horse and pig & goat rings also boast larger exhibiting areas. The Show (map here) can now accommodate further livestock, making room for a number of other breeds including cattle with European Angus, Beef Shorthorns, Dexters and Irish Moiled, horses with Coloured Horses and Connemara Working Hunter and sheep with the addition of Swaledale and Lanark Type Blackface. 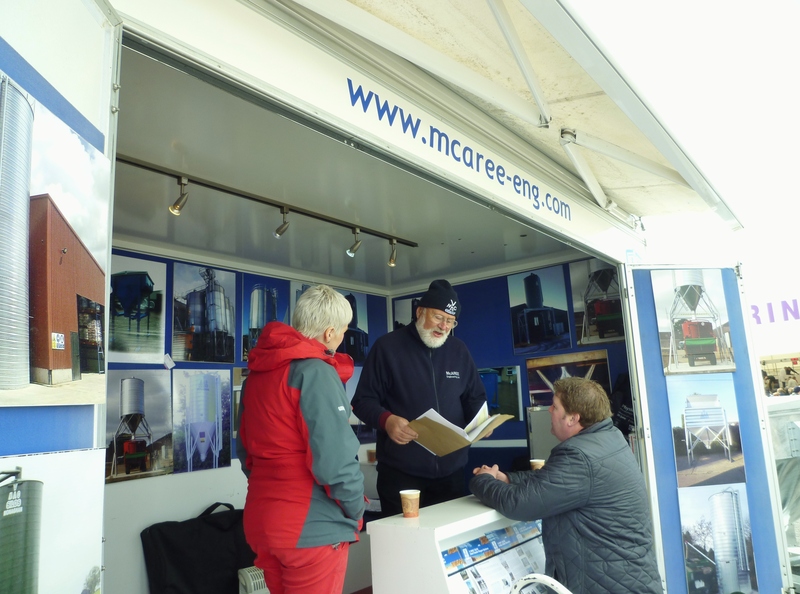 Greater acreage has led to a greater number, size and range of exhibits, as RUAS Chief Executive, Colin McDonald explained, “We are very excited about the new Showgrounds and the amazing opportunities it presents to expand and enhance the Show. The move has allowed us not only to safeguard the future of this event and the Society but also to build upon our century long track record of showcasing food and farming excellence.” There will now be room to bring back plant machinery exhibits. Two of the most popular attractions – the Garden Village and the NI Food Pavilion have both expanded. Food, a key component of the Balmoral Show, will be available in abundance throughout the Showgrounds and in the NI Food Pavilion which will offer more local variety than ever before. The Garden village will be the location of the Womens’ Institute tea rooms, where you can enjoy a relaxing break while enjoying their new home industries section. The new feature show garden will be a combination of contemporary gardens, an elegant classical garden, a Japanese garden and an open countryside. There will be four official car parks around the Showgrounds, in addition to dedicated exhibitor car parks and disabled facilities. Provision has been made for up to 10,000 cars. 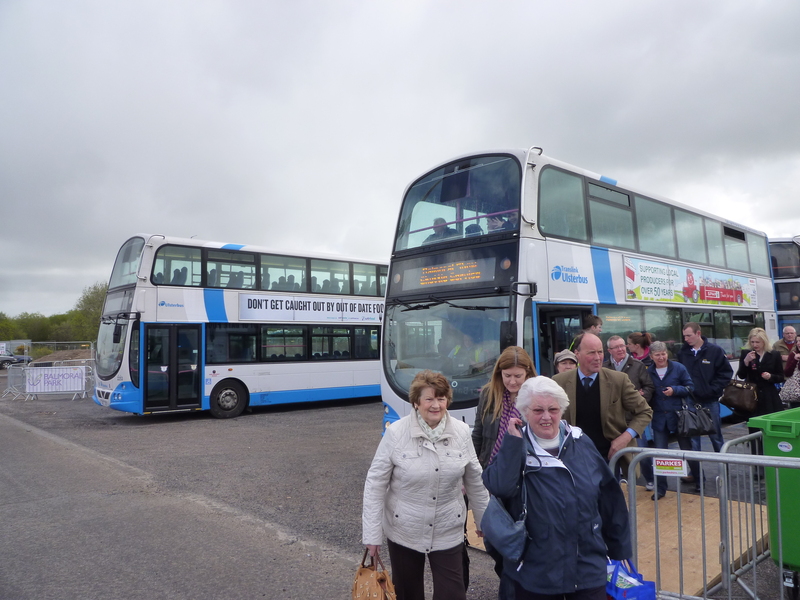 Public transport will be available and more details will be released later by Translink. 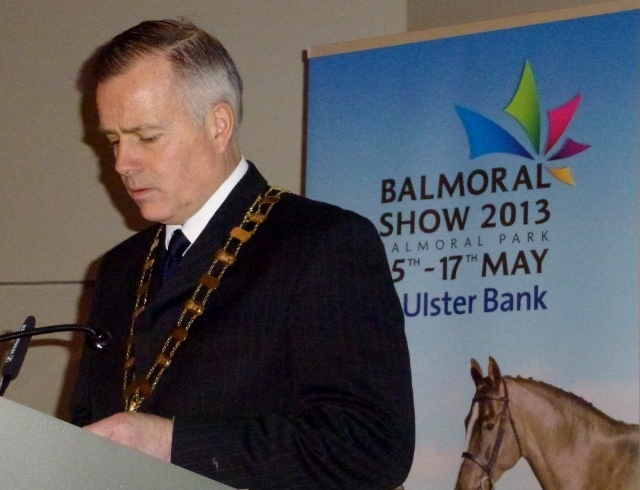 Balmoral Show will take place at Balmoral Park at the Maze near Lisburn on Wednesday 15th to Friday 17th May 2013. The Show runs from 9.30am to 8.30pm on the first two days and until 8pm on the final day. Further details can be found here. 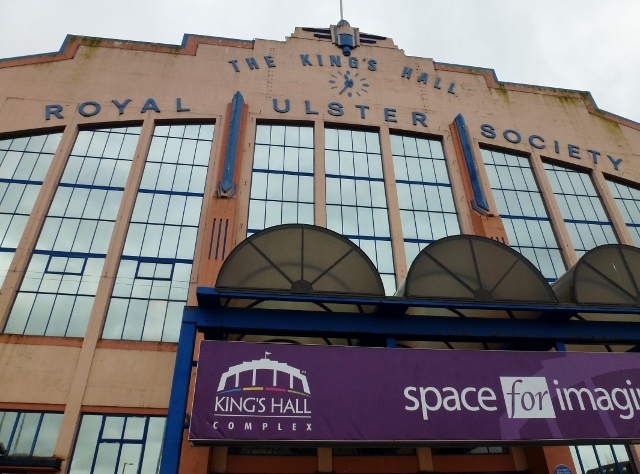 The question now is what will happen to the King’s Hall complex, where some of the older pavilions used by the RUAS and the grandstand have been demolished. There was planning permission a few years ago for around 140 houses on a section of the site. The Hall itself which was opened in 1934 is a grade B1 listed building. It remains the largest exhibition area in Northern Ireland. It was also a famous boxing venue. Rinty Monaghan boxed several times in the hall. A blue plaque was unveiled in his memory at the hall in 2007. In 1985 the Clones Cyclone Barry McGuigan made his first title defence against Bernard Taylor at the Hall, having fought there on six previous occasions.